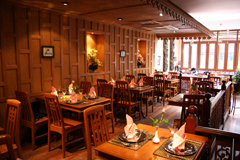 This long-established, comfortable and welcoming restaurant serves an excellent range of Thai dishes. The menu is exciting and innovative – the true lover of Thai food will appreciate the blend of fresh herbs and spices which complement the imaginatively presented dishes served by friendly and professional waiters and waitresses. The philosophy at Jasmine Thai is to provide exotic Thai dishes at value for money prices, backed up by service that is both professional and friendly. The menu includes traditional Thai dishes as well as some unusual and original dishes and an excellent range of fish and seafood and vegetarian. The ambience of the restaurant is relaxed and welcoming – whether for a family occasion, an evening out or a party – and the service friendly and helpful. The finest Thai cuisine at affordable prices.